BigHit Entertainment’s Global Pop Sensations, BTS, join forces with DJ Steve Aoki and rapper Desiigner for their highly anticipated collaboration. 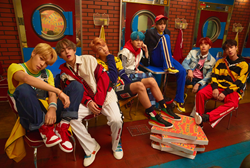 The remix of “Mic Drop” will be released worldwide on November 17th, just 2 days before BTS takes the stage to perform at The 2017 American Music Awards for their first U.S. televised performance. Named #14 on US Weekly’s “Most Influential Celebrities on Social Media” amongst public figures such as Beyonce and Ellen DeGeneres, BTS continue to cement their reputation as global pop stars. Outlets such as Forbes, New York Times, NPR, Entertainment Tonight, The Fader, and The Recording Academy have also taken notice of BTS’ ever-growing milestones, which will only continue to escalate throughout the new year.